Celery is a biennial plant that is part of the Apiaceae species. Celery is known for its tall leafy stalk and crunchy texture. The fruit and seeds of celery is dried and pressed into oil which is then used to treat common medicinal illnesses (WebMd). One of the many benefits of celery is that is can help to lower blood pressure. Celery contains the natural compound phthalides. Phthalides have been found to relax the muscle around the arteries which dilates the blood vessels and leads to an increase in blood flow (Celery). Celery also contains potassium, calcium and magnesium which help to lower blood pressure as well. 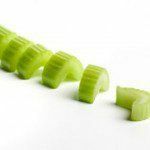 Celery also has diuretic properties because it contains potassium and sodium as well as other compounds that help to regulate and balance the fluids in the body. Sodium and potassium in particular help to stimulate urine production which leads to fluid balance within the body (Ehrlich). Because celery is a diuretic, it helps to maintain and promote normal kidney function. Having normal kidney function helps to eliminate toxins from the body as well as prevent kidney stones from forming (Celery). Celery has a natural laxative effect which helps to alleviate the pain resulting from constipation. Women who are pregnant should not consume celery seeds as they may lead to uterine bleeding and muscle contractions (Ehrlich). People with active kidney infections should also not consume celery seeds. People who are eating celery seeds should wear sunscreen lotions as the chemicals found in the seeds can cause an increase in the skin’s sensitivity to UV rays. Gamonski, William. “Celery Benefit.” . Livestrong, 14/02/2011. Web. 25 Jun 2012. Nagan, Venessa. “Capsaicin.” DermNet NZ, 19/04/2011. Web. 25 Jun 2012. Terry , Sarah. “Celery side effects.” . Livestrong, 11/04/2011. Web. 25 Jun 2012. Woodard, Stephanie. “Celerys.” Yahoo Health, 22/06/2012. Web. 25 Jun 2012.